The next time nine-year NFL veteran WR Chad Ochocinco wins a playoff game will be the first. In the meantime, he'll keep busy snowing the general public with reality shows, name changes, touchdown stunts, and dancing with D-listers to create the perception that he's one of the highest-profile and therefore best players in the league. Host: "When's the last time you saw so many girls on one field?" 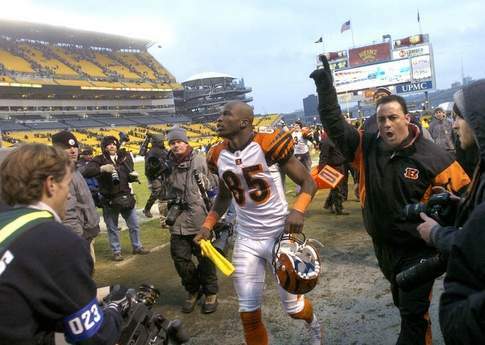 Ochocinco: "When we played the Steelers"
Ha, ha, ha. Because the Steelers are girls! Get it! Girls who've beaten Ochocinco 11 of 16 times in the regular season and the only time they met him in the playoffs (which was en route to a Super Bowl win, mind you). He's right, the Bengals are totally better than the Steelers. Just remember, people aren't laughing with you, Chad. They're laughing at you. And best of luck in your next attention-seeking endeavor. Maybe one of these days you'll actually be famous for your exploits in the postseason and not your latest PR stunt (of which I'll try not to fall for). Ochocinco is a hilarious attention whore and nothing more. Nobody takes him seriously so just enjoy the self-parody he's become. Relax Don, because anything Chad does on VH1 is better than Big Ben in Georgia. Can't this just be hilarious? I think the bengals should trade for Chad Johnson. Johnson was pretty annoying, but the Chad 85inSpanglish guy is over the top ridiculous. Here to football stories though! HEY HEY! Lighten up. I actually think he's funny. The NFL needs more players like him. You're getting wayyyy too angry over a silly, tongue in cheek comment. If it wouldn't warrant a elementary-school recess detention, then it shouldn't warrant a blog post. A better response may have been to post a headline... "85 thinks Steelers are girls" with a picture of him ballroom dancing, in pink pants, or looking like a feminine Chris Rock in 5th Element. Same point, less whiny, and marginally funny. Johnson is a clown and is harmless, but is he really good for the NFL? Didn't he reportedly try to take a swing at Marvin Lewis at halftime of the Steelers Wild Card loss? Didn't Lewis deactivate him in the '08 game for violating team rules? Hey, I think it's cute that he likes to bring attention to himself, laughed at his antics for the 'Hard Knocks' series last year. He usually turns into a pumpkin after November though. what was the meaning? I got nothing . please reexplain the article . I am interesting in your other post, waiting for your reply.